The theme of The Art Show is an exhibition opening in a gallery. The artists based their characters on friends and well-known figures in the art world of the 1970s, including their own three children. 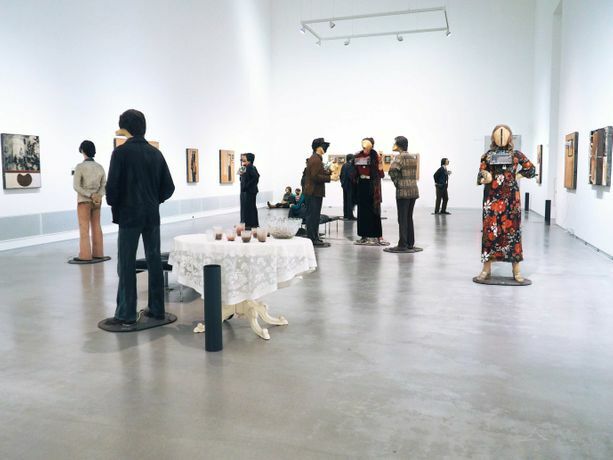 The autodidact Edward Kienholz began thinking about this tongue-in-cheek, walk-through scene between 1963 and 1967, when he was still in the United States. Its implementation, however, has close links with Berlin. The husband-and-wife team came to Berlin in 1973 on a DAAD residency and decided that in future they would spend a part of each year in the city. They also decided to create The Art Show here. For about twenty years, from 1973 until Edward Kienholz died in 1994, the couple were familiar faces in the Berlin art community. The Art Show, one of their major works, was acquired by the Berlinische Galerie collection in 1996.